One of the finest ways to appreciate Cape Town is from the top of Table Mountain with its panoramic views over the City Bowl, Table Bay and beyond. 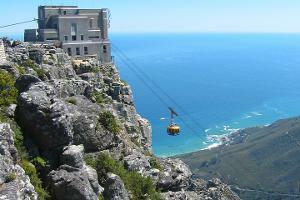 THE TOUR: Weather permitting, this tour starts with an exciting ride on the cable car to the summit of Table Mountain. After your descent you’ll tour the cosmopolitan centre of the city - passing through the colourful Malay quarter (known as the Bo-Kaap), visiting the Company Gardens, the Castle of Good Hope (time permitting) and Diamond Works. If time permits, we’ll drive around Table Bay to the Milnerton area to give you the opportunity to photograph an iconic view of Table Mountain (weather permitting and not available for 2019 season). NB: After purchasing this tour please buy your Table Mountain cableway ticket on www.webtickets.co.za It is important that you pre-purchase your Table Mountain cableway ticket to avoid long queues at the ticket office on the day. This half day tour departs from the city centre at around 08:00 or 13:00. Cape Town’s fantastic scenery, Mediterranean climate and friendly people have made it one of the world’s favourite holiday destinations. The city began as a Dutch way station in the 16th century. Protecting and refreshing weary sailors as they passed the tip of Africa. It grew steadily through the centuries, fed on a diet of French settlers, Indonesian and Madagascan slaves and English colonists. A thriving farming and wine-making industry was established thanks to the rich, fertile soils of the Cape. Today this rich history comes together in distinctive architecture and a unique local culture. CAPE TOWN CITY CENTRE: The fine old buildings of the Cape Town represent a journey through the centuries. You can see influences from the many people that have made Cape Town their home over the years. The Castle of Good Hope was built in 1666 by the Dutch East India Company to protect the replenishment station and is the oldest surviving colonial building in South Africa. For many years, it was a centre for official life in Cape Town and is still the main headquarters for the South African military in the city. A short distance from the Castle, across from the Grand Parade, you can see the City Hall, a mock baroque building constructed in 1905. Much of the building’s fixtures and fittings were imported from Europe. As we follow the city’s main road, Adderley Street, we will see St. George’s Cathedral, the Anglican Diocese of Nobel Peace Laureate Archbishop Desmond Tutu. Also keep your eyes out for the Company Gardens, which were established in 1652 by the Dutch Settlers to re-provision passing ships. Today the garden is a welcome green oasis in the middle of the city. BO-KAAP: Explore the vibrant Bo-Kaap. We will go through the Malay Quarter (also known as the Bo-Kaap, which means 'Above Cape' due to it being up against the slopes of Table Mountain). In the early 18th century, a multitude of slaves from Java, Ceylon and other Far Eastern regions were brought to Cape Town. After slavery was eliminated, their descendants, known as the Cape Malay’s, settled here. The first mosque in the Cape was built here and is still in use today - albeit much altered. The Bo-Kaap became an exclusive residential area for Cape Muslims during the Apartheid years. It remained one of a handful of few working class neighbourhoods that were still close to city centres in the country. TABLE MOUNTAIN: We now arrive at the lower aerial cable-way station, positioned about half way up the iconic mountains’ lower slopes. The aerial cableway offers a fun and quick way to get to the top. Rotating cable cars give visitors a fantastic 360° view as you ascend to over 1000 metres above sea level. It is impossible to picture Cape Town without the iconic shape of Table Mountain in the background. A flat plateau gives this mountain its distinctive shape and when the conditions are right a mass of cloud streams over the edge, giving the mountain its table cloth. Legend has it that the 'table cloth' is the result of a smoking contest and a local pirate known as Van Hunks. The mountain lies at the northern end of a sandstone mountain range that extends throughout the Cape Peninsula like a spine all the way to Cape Point. The upper part of the mountain consists of hard wearing sandstone, which is how it’s characteristic cliffs are formed. Table Mountain is privileged to have the smallest and richest floral kingdom in the entire world. You can find over 1470 species throughout the Table Mountain National Park. Visitors and locals alike flock to the mountain for hiking, sight-seeing and other activities. EXPLORE THE TOP: You will now have some time to explore the top of the mountain. You can wander across well-marked paths to see views from all sides of the plateau. Look out for the unique cape vegetation or enjoy the antics of the rock dassies as they stretch out in the sun. These little creatures are actually the elephants’ closest living relatives. You can also sit back and just enjoy the view, considered one of the best in the whole of Africa. When it’s time to come down you can enjoy another ride in the rotating cable car. TABLE BAY - MILNERTON: (Not available for 2019 season) See the view from across Table Bay. If there is enough time we will take a drive around Table Bay so you can get a long distance view of the mountain and the Cape Town city centre. This is how the first mariners to this area would have seen Table Mountain is a great chance for shutterbugs to whip out their cameras. RETURN TO CAPE TOWN: At the end of an insightful tour exploring Cape Town, we hope that you have gained some insights about this fascinating city. We will return you to the Cape Town city bowl in style and comfort.